Paradoxes are a fascinating part of reality and there are paradoxes in many different fields like math, physics, logic, psychology, and language. When it comes to trying to understand them, paradoxes can make the brain feel like it’s doing somersaults, but they can also expand your mind and make you look at the world in a whole new way. Imagine if you will, there is a hotel with an infinite number of rooms and each room is booked with an infinite number of guests. If that were the case, then every single room would be booked, right? Because an infinite amount of guests would fill an infinite amount of rooms. But the hotel has a weird paradox where there are always vacancies and they are always booked. This can be seen when a new guest shows up. To find him a room, David Hilbert, who thought of the paradox, suggested that everyone move to the next room. For example, one moves into two, two moves into three and so on. But what happens if more than one person shows up, say another infinite amount of people? Hilbert says that the people in the rooms could just go to the room number that is double their current number and then there will be room for everyone. This paradox speaks to the nature of infinity and has fascinated mathematicians for decades. It also probably has given more than a few hotel employees terrible nightmares. Logician Carl Gustav Hempel first proposed his “raven paradox” in the 1940s and it questions our belief in confirmation. We make confirmations in both science and everyday life based on observations. For example, let’s say a detective was trying to solve a crime. He would find evidence and the evidence would back up his theory, disprove his theory, or the evidence could be neutral. The evidence could also be strong or weak. What Hempel asks is what does it take for a piece of evidence to confirm the hypothesis, rather than disprove it or be neutral about it? To demonstrate the paradox, Hempel talked about ravens. He said that after observing a few ravens and noticing they were all black, someone may infer that all ravens everywhere are black. But that is impossible to check, because there have been so many ravens throughout history and there will be more in the future and just one non-black raven would disprove the theory that all ravens are black. Also, there is the contrapositive, which is another theory that is the opposite of the hypothesis but it is still true. For example, the contrapositive for “all ravens are black” is that “all non-black things are non-ravens.” That means that every single thing that is non-black and non-raven, like a blue shirt or a yellow tennis ball, proves that ravens are black. Of course, there are way too many non-black non-raven things in the universe and so that type of information really does not contribute to the hypothesis that all ravens are black. The raven paradox is meant to be a warning against generalization and that there needs to be a limited scope if a scientist wants to prove something beyond a doubt. An interesting paradox involving social circles is that you most likely have a friend who has more friends than you do. This seems like a pretty broad statement considering we don’t know you personally, but we’re sure we’re right. The reason we can assuredly say you have a friend who is more popular than you is because nearly everyone has a friend who is more popular than them. But, why is that? Well, first and foremost, people with a lot of friends are more likely to be your friends anyways. But why everyone probably has a friend more popular than themselves is because popular people are part of more social networks so they are misrepresented in averages because they appear more times. This makes it look like there are more popular people, but popular people actually just spread themselves out more and this effects probability. Of course, the paradox is much more complicated than we’ve explained, but if you like to learn more, visit this great New York Times article about it. So if it seems like other people are more popular than you, they probably are, but that is due to the laws of probability. The Barber Paradox from British Philosopher Bertrand Russell takes place in a small town with some strict personal hygiene laws. In the town, by law, all men must be clean shaven and they have a choice as to how they shave. They can either be shaved by the one male barber in town, or they can shave themselves. The paradox that arises is: who shaves the barber? When he shaves, he is shaving himself and he is being shaved by the barber. We highly recommend not asking your hairdresser about this paradox next time you get your haircut; they may lose their concentration while thinking about it! Written by the Ancient Greeks and first described by philosopher Jean Buridan in the late middle century is the paradox of Buridan’s Bridge. In the paradox, Socrates is travelling and wants to cross a bridge that is being guarded by Plato. Plato tells Socrates he can only pass if he tells him the truth. But if Socrates were to lie, Plato would throw him over the bridge to drown him. Socrates responds by saying, “you will throw me in the water.” So what will Plato do? Throw Socrates in the water? That would mean, Socrates was telling the truth and should have been allowed to pass. But if Plato allows him to pass, then Socrates wasn’t telling the truth. The liar’s paradox can be summed up in one sentence: “Everything I say is a lie.” But it is impossible for that sentence to be true because if everything I do say is a lie, then that sentence would be true, meaning that not everything I say is a lie. To illustrate the point, let’s look at two variations of the paradox. For the card paradox, pretend you had a card or a piece of paper, and on one side of the card it says, “the statement on the other side of this card is true.” While on the other side, it says “The statement on the other side of this card is false.” Both sentences can’t co-exist with each other on the card because they cancel each other out. Another variation of the liar’s paradox is the Pinocchio paradox. 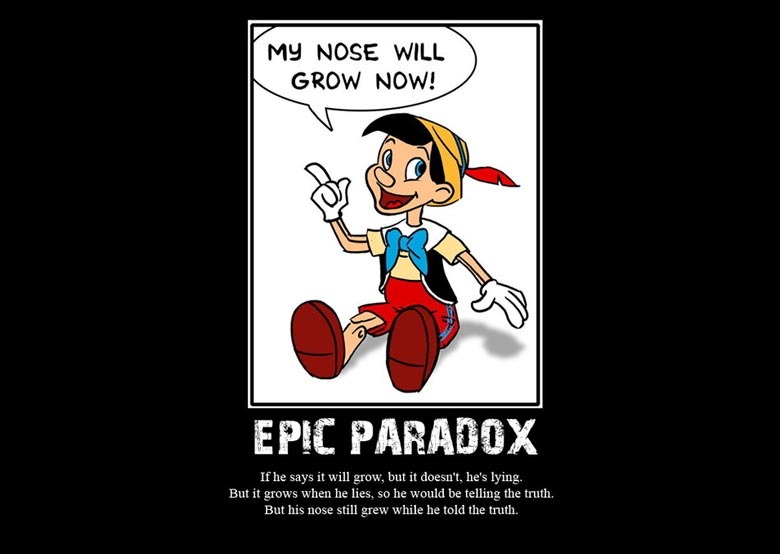 In the paradox, Pinocchio lies and says, “My nose grows now.” Since he’s lying, his nose should grow, but if his nose grew, then he wouldn’t be lying. Hopefully Pinocchio doesn’t test that paradox in the upcoming movie about him; his little wooden head might explode. A million grains of sand is a heap. A heap minus one grain of sand is still a heap. That means if you removed one grain of sand, 999,999,999 grains of sand would be left and that is still a heap according to the second presumption. But what if you kept removing grains of sand one at a time, when would the heap stop being a heap? If the second presumption is true, then even one grain of sand or a negative amount of sand would be considered a heap. If that wasn’t thought provoking enough, then hopefully The Ship Of Theseus will get you thinking a bit more. Imagine there was a boat and piece by piece, the entire ship is replaced. Is that still the same ship? Another example is Washington’s ax. Is it still his ax when the handle has been replaced three times and the blade twice? Both speak to the nature of identity and asks the question, when does an object stop being that object? Interestingly enough, debates about these paradoxes are starting to emerge with the possibility of human and computer augmentation. If a person gets computer or machine upgrades on their mind and body, at what point do they stop being a human and become a machine? If you had a group of 23 people, what are the odds that two of those people shared the same birthday (month and day, not year)? Logically, it seems like a pretty small number. After all, there are 365 days in a year and only 23 possible birthdays. Yet, there is a 50 percent chance that two people will share the same birthday. If there is a group of 30 people, then there is a 70 percent chance and if there is a group of 70 people, then there is a 99.9 percent chance that two of them will share the same birthday. But why is that? Well, it’s a rather complicated process involving the laws of probability. To make this easier, we’ll look at the probability for each person. When the first person walks into the room, there is zero chance anyone has the same birthday as him or her because no one else is in the room, making the probability 365/365. Then the second person walks into the room and the chances of them having a unique birthday are 364/365. Then for the third person, it is a 363/365 chance that they will have a unique birthday. This continues on until the 23rd person, who has a 343/365 chance of having a unique birthday. Then you multiply the 23 probabilities together and it equals 0.491 and then you subtract that from 1, which leaves you with 50.9. Which means that the odds that two people out of 23 will share the same birthday is 50.9 percent. To test the theory for yourself, try random combinations of 23 people on your social media accounts. About half the time, you should find two people with matching birthdays. Paradoxes are a fundamental part of time travel and one of the more interesting ones is “the bootstrap paradox”, also known as causal loops. The paradox gets its name from the short story “By His Bootstraps” by famed sci-fi author, Robert Heinlein. The paradox works like this: let’s say you bought a copy of Romeo and Juliet and travelled back in time to the English Renaissance. Once there, you find a young William Shakespeare and you give him the copy of Romeo and Juliet. He copies the play word-for-word and then he simply presents the play instead of writing it. As the centuries go on, it’s finally the present day and you find the same copy of Romeo and Juliet that you gave to Shakespeare. Now, if you gave Shakespeare the story, then who wrote Romeo and Juliet? This paradox purposes the question, is anyone or anything ever really present? To consider the paradox, it is important to ask what exactly is “the present.” A second? A nanosecond? Well, those units of time can be broken down into three parts; the beginning, the present and the end. But then each time it gets dissected, the new present could be divided again into the beginning, middle and end. And theoretically, this can just keep going on indefinitely and the present can always be divided into three smaller parts. So if time can always be divided, does the present ever exist? Because if the present can always be broken down, that would mean there is no duration known as the present and there is no gap between the past and the future. A further extension on the paradox is that in order for something to exist in our universe, it has to have a duration. For example, something can’t exist for no amount of time. So if the present has no duration, does that mean the present doesn’t exist? And if there is no such thing as the present, what does it say about the existence of the universe? Want to read more about people who just want to screw with your head? Check out 10 Greatest American Philosophers and the Top 10 Most Famous Thought Experiments. #4 subtracts 1 grain from a million and gets 999,999,999? #4 can also apply to speciation in evolution. as mutations occur in generation after generation, at what point do the offspring become a different species from their parents? at some point, the offspring cannot breed with their parents’ generation. #3 isn’t really a paradox either, it’s simple probability math. it does make a presumption that all birthdays are equally likely, which isn’t true, since September, 9 months after New Year, is the most common birth month. that might in fact make 2 people out of 23 having the same birthday even more likely. #2 was used in Star Trek: The Animated Series. Adult Mr. Spock had to go back in time to save his own life as a teenager. The paradox is that teenage Spock couldn’t master the Vulcan neck pinch until adult Spock teaches it to him after saving his life.